The facility viewed from a corner of the farm. After the Coffee Festival and Conference, the Trung Nguyen Company gave Kelly and me a private car and driver to get back to Đà Lạt (what luxury!). They really know how to treat guests... Instead of heading straight home, though, we took a detour to Golden Bell S Coffee's farm and processing facility and farm in Mê Linh, near Lâm Hà, in Lâm Đồng province, where we spent the rest of the afternoon and evening touring the grounds of the cleanest, most well-organized farm and facility I've seen in this country (in the world, really, but I haven't been everywhere...). Up a dirt road near a small town, the facility was visible from more than a couple of kilometers away. It was majestic, sitting like a modern castle atop the highest mountain ridge in the area, and I was eager to get there much faster than we could go. On the way, we caught glimpses of neighboring farms, with cracked clay dirt, weeded into desert conditions with trees so close together the branches were tangled. I couldn't imagine trying to harvest in those coffee thickets. As soon as we arrived at the grounds, though, it was a different world - healthy, well-managed trees and soil, plenty of space and fresh air. Located on about 14 hectares, the farm is owned by a group of local Buddhist Monks who have welcomed the Taiwanese group to build a facility and consult them on everything from farm management to retailing their product (the only condition being that the farm maintain strict vegetarian practices, down to the food consumed on the farm. Workers must leave the grounds when they wish to consume meat). The main plot is composed of 7-year old Robusta and Catimor trees and serves as the first stage of a project towards building a Specialty-grade system. The group wishes to show the monks that their system will work on their current product before asking them to remove the lower-value trees to make room for better varieties (a fair, long-term approach). Across the valley, the monks own a 6 hectare plot where the Golden Bell group are propagating and planting better, non-Catimor Arabica varieties. This Fall-Winter harvest will be this plot's first production year. The trees were pruned and spaced well, with wells dug around the base of each one to prevent erosion and water loss. Shade trees have been planted among the coffee, along with perennial peanut as ground cover. Full transparency is another condition placed on the group by the monks, as they wish to share everything they're practicing with neighboring farms. The neighbors thought the GB group were crazy the first month they were there, pruning and stumping trees, believing they were going to decrease the yield too much! Then, during the last harvest, the neighbors asked how GB got such huge, healthy cherry development. Now, they have the neighbors' attention and are being watched every day with curious eyes. Some of the trees were in bloom and the air was unbelievably fragrant, making our stroll back to the facility a dream-like journey through a jasmine paradise. We were asked to remove our shoes and offered slippers upon entering the processing facility. It was so clean it looked as if they were just setting up when, in fact, they were just finishing up the previous harvest. The cleanest, most well-organized processing facility I've ever seen! The entire facility, including the equipment, is the brainchild of Kuo-Kuang Cheng, a Taiwanese engineer, inventor and coffee enthusiast. He's designed all of the equipment to handle small amounts of production (as little as a couple of kilograms at a time), to encourage experimentation at every step, with a goal to making all of the equipment affordable to small estates and cooperatives around Asian coffee regions. This isn't just a processor, but a learning center, and they welcome guests year-round. The staff is stoked to show visitors anything they want to see, highlighting the facility and farm's full-transparency approach to operation and information. 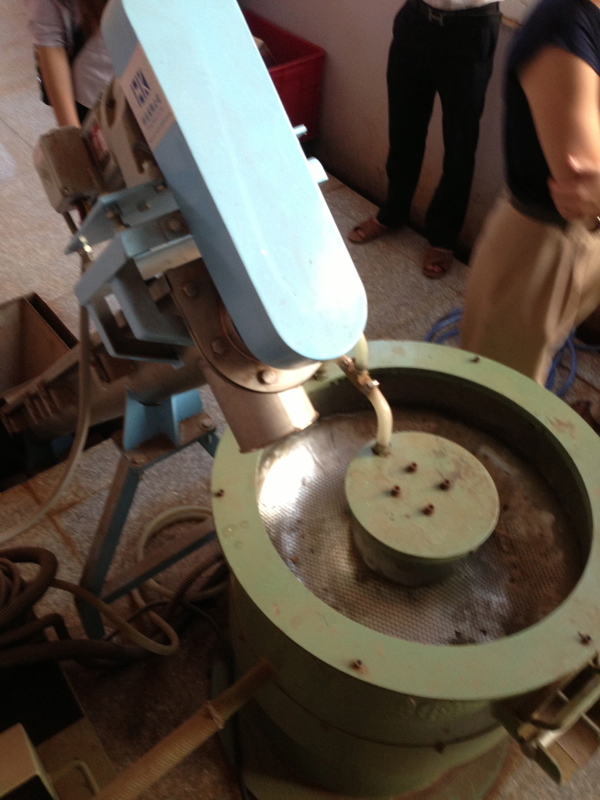 Mini cherry separation tank and pulper. The cherry separation machine utilizes both floating and size sorting techniques, beginning separation at the cherry stage. Each product from this part of the process is pulped separately and fermented with pectinase in small stainless steel bins. Following the fermentation stage, the coffee is fed into a sonic washing and demucilaging machine, which cuts down on water usage during washing. After the remaining fruit pulp is removed, the coffee is placed onto racks and mechanically dried on low heat to 30% moisture content. Vented drying racks for parchment coffee. Drying is finished to 12% moisture content on vented racks, which are loaded and brought to the marble rooftop drying patio. These racks are rotated and agitated every hour or so, until drying is complete. Yue-Wen and Kuo-Kuang with the Dry Hulling Machine and modified Polisher. 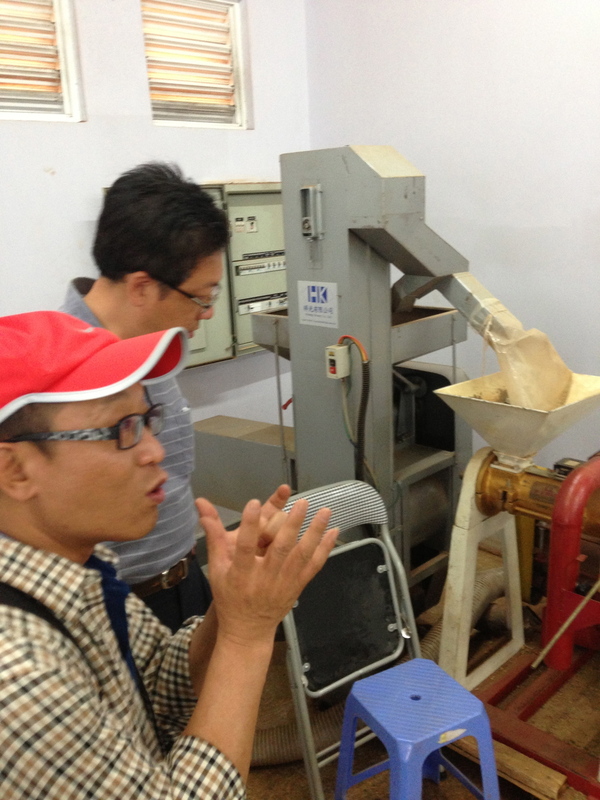 One problem that Yue-Wen and Kuo-Kuang has identified is combination dry huller-polishing machines, which tend to heat the green coffee as it is peeled and polished (usually quenched with water, which leads to curling and uneven moisture content between seeds). Their solution was to polish just after peeling in smaller amounts, which tempers the heat produced in the process. A modified McKinnon polisher was the only piece of outsourced equipment in the processing facility. 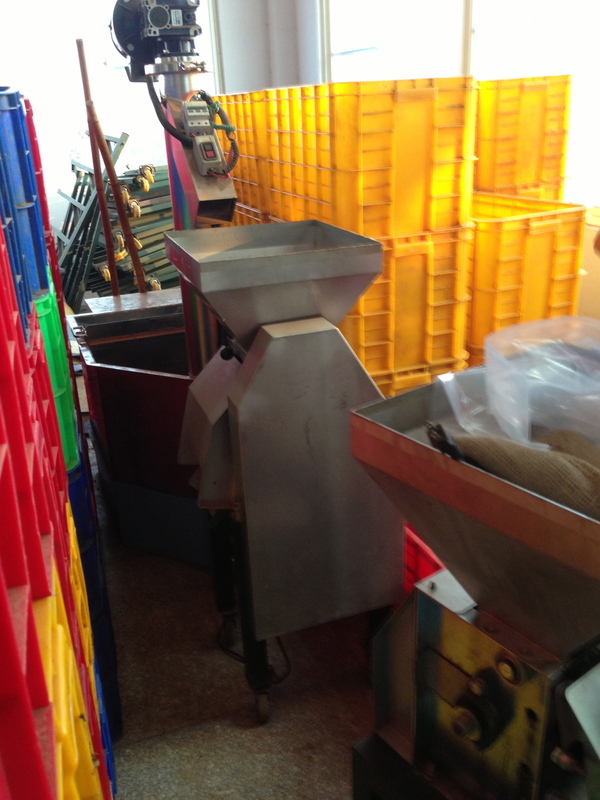 After polishing, the green coffee is sent to the density sorter, which separates the product into three screen sizes - 18, 16, 14 and below. 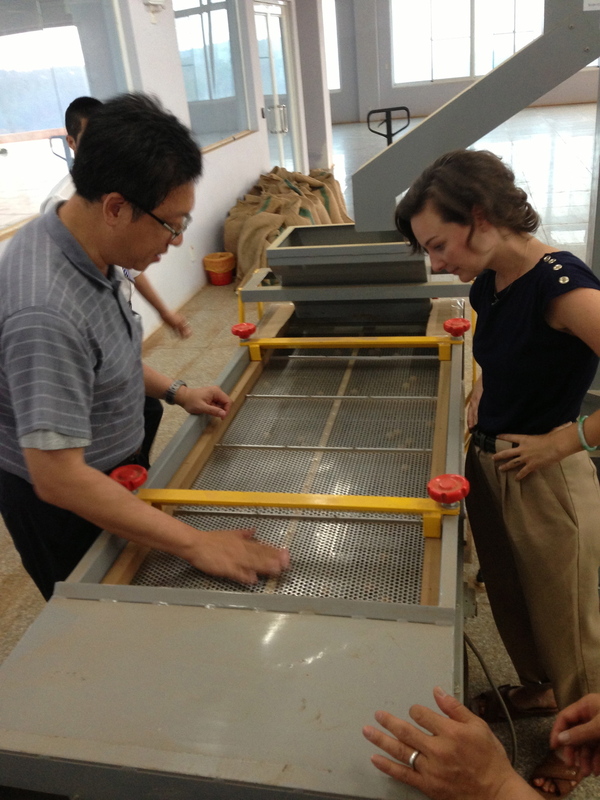 The density sorter is Kuo-Kuang's design, with slats across the layers to help each bean stand up on end to properly separate. There are wooden balls on the lower levels to keep the coffee moving along. Learning from his experience in the cotton processing industry, Kuo-Kuang combined a vibration table and blower to complete the density sorting process to 80%+ accuracy. Green Coffee Storage Racks allow for airflow between bags and humidity control. The second floor of the facility contained a mezzanine with hand-sorting tables, micro-batch roasting and processing areas, along with a glass-walled conference room. On the third floor, green coffee in burlap was placed onto racks (rather than pallets) to increase airflow between layers and to mitigate humidity buildup. 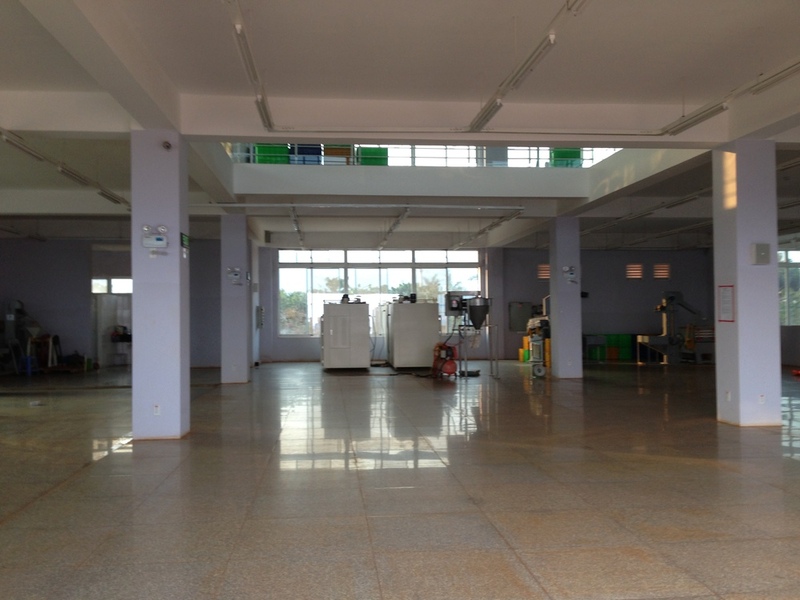 The cupping and training lab is also located on this floor. The cupping and training center was the largest, cleanest and most decked out lab I've seen. Larger than most family-sized apartments in Vietnam, the lab had everything an aspiring coffee nerd could need to test and assess the product, conduct training sessions, cup coffee and hold public events. Yue-Wen graciously offered this space to me for my experimenting and assessment needs. This was the highlight of my day. The space had a Lysander sample roaster, and a small fluid-bed roaster, an espresso grinder and Grimac Diadema Delux 2-Group machine (E-61 groupheads and good steaming capability), on which I of course made a few lattes for the staff, who were hungry for further espresso training. In return for this generous access, I plan to offer training to their baristas here in the near future. Yue-Wen was also kind enough to invite me to conduct processing and roasting experiments here later during the next harvest, which I will definitely take him up on! Under construction, the waste water recycling system and tree planters for shade and wind-break. Still under construction, the waste water recycling system combines anaerobic and aerobic techniques for use in their irrigation systems. There were about two-dozen planters in which trees will be placed to act as a wind-break and shade system. Tough grasses were planted along the edges to prevent soil erosion. The roof had a huge marble drying patio and a breath-taking view. The rooftop patio is constructed of marble tile (to reduce odor absorption) and has a beautiful view of the surrounding mountains and valleys. This wasn't my only visit to the facility, and I have cultivated relationships with the staff and group directors since the first trip (including the monks, who happen to share my dietary outlook). I look forward to being a regular visitor and collaborator in the years to come! View of the plot from the facility.